15 years ago today, Dandy was discussing his favourite subject...FOOD! We very nearly had a major disaster. I thought that there was no hope, but at the very last minute, the 2-foots redeemed themselves...... It had become clear over the last few days that the supply of carrots with the nice green tops had become depleted to the point where when we were being made to go to bed, our usual treat of carrots with green tops had become rather sparse. What carrots there were just had a few tatty bits of green on them, but last night, it seems that the 2-foots worked especially hard at the Sainsbury's allotment, and they came home with a big bag of nice fresh carrots with green tops! 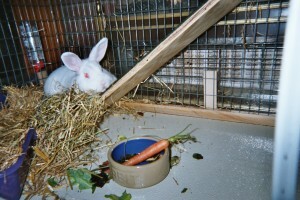 We think we had better get our 2foot off to the allotment, as our carrots are only, well, just carrots NO GREEN TOPS. We used to get green tops, but now JUST carrots. Although we do still have greens, celery, tomatoes, spinach and radishes, all very yummy. Thankfully Honeybunny is better today, the trick worked, no treats ...... more for us. Love - Loppy, Mister Jingles, TiGgEr, Honeybunny and Bobbin.